Illinois Dermatology Institute (Elk Grove Village) - Book Appointment Online! 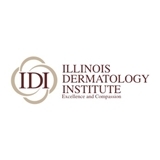 Illinois Dermatology Institute, or IDI, is a partnership of dermatologists committed to providing excellent, cutting-edge medical care balanced with compassion – both of which are necessary for a successful and fulfilling doctor-patient relationship. The foundation of IDI is built on time-honored values of patient-centered care. We treat people rather than simply focus on their skin diseases. And as outside forces attempt to change healthcare into a business, our commitment is to continue to provide the type of care that our patients deserve. IDI physicians cover the many facets of dermatology: medical, surgical, and cosmetic. We have convenient locations in the Chicagoland area. If you are a patient, we invite you to discover the kind of dermatological care that sets us apart. If you are a dermatologist who feels the same way we do, we invite you to learn more about us as we continue to grow.